We had to hurry over to our next appointment at Chateau Angelus – luckily there was pretty good signage on the way, or who knows how long it would’ve taken us to find the estate on the winding roads. But when we did find it, wow – it was a hive of activity! The Chateau itself is undergoing renovations – there were workers, trucks and heavy machinery in front of the main entrance. 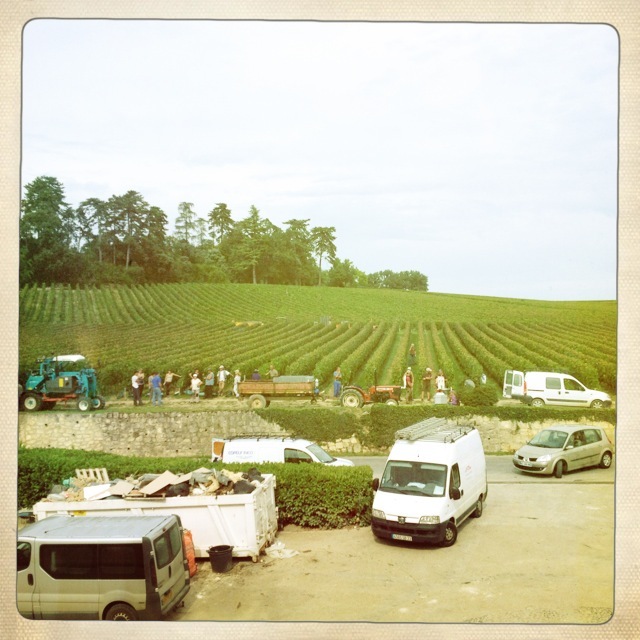 Right across the street in the vineyards, there were more trucks and workers – they had also started harvest that day. We were met by a member of the Angelus PR team, who very kindly informed us that they were also shooting a video on the premises that day, so we were somewhat restricted by where we could go and when, within the Chateau. A busy day, between harvest and renovations. 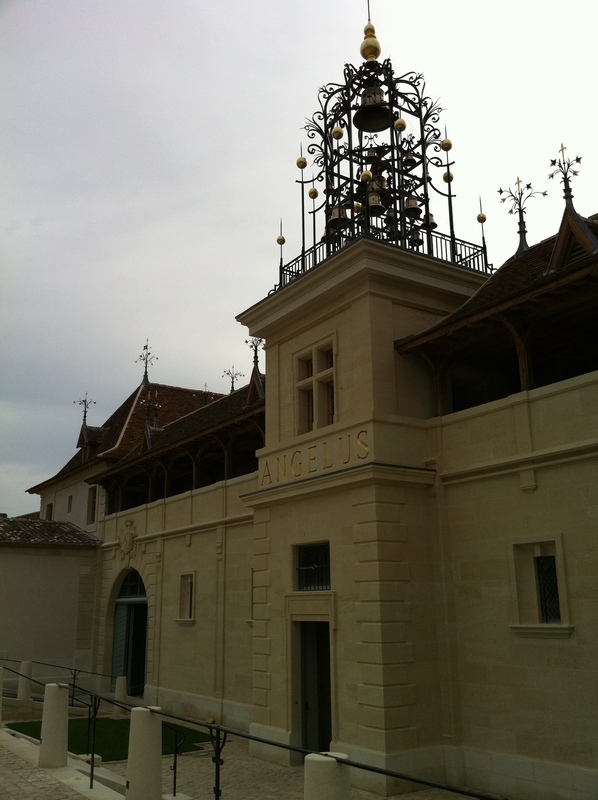 By way of background, I was quite excited to visit Angelus, because of the stellar reputation of the wines. It is one of only four premier grand cru classe A estates in the St. Emilion region – an honor recently bestowed on them in 2012 and a testament to the hard work of the family to bring the estate’s wines back to its original quality. In fact, the brand has been getting more and more play lately – it has even been featured in one James Bond film – Casino Royale. It almost made it into another, but unfortunately, all of the footage of Angelus in the second film ended up on the cutting room floor. According to Ch. 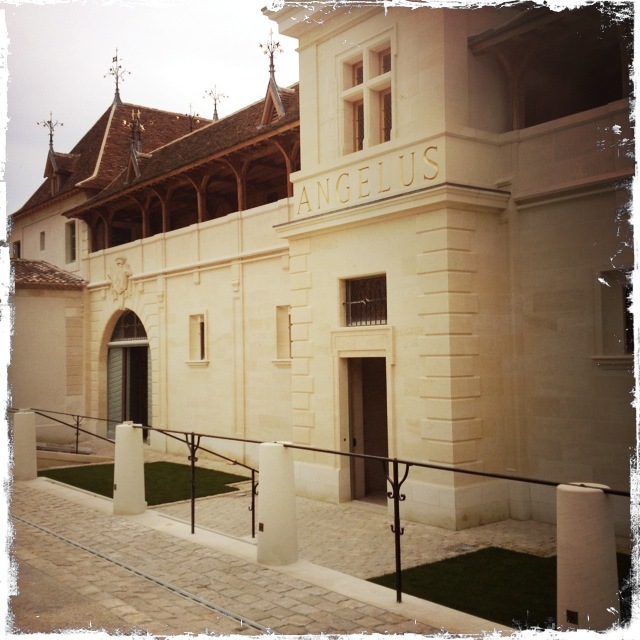 Angelus history, the estate began with Georges Bouard, who was born in 1544. At the end of the 18th Century, Catherine (also known as Sophie) de Bouard de Laforest, who was born in 1773, married Souffrain de Lavergne and came to live at Chateau Mazerat in St. Emilion. At the beginning of the 20th Century, Maurice de Bouard, acquired the enclosure adjacent to Mazerat. The estate then took on the name from a very ancient patch of vines in the center where the vineyard workers could hear the Angeleus (or the church bells), ring from the three churches of the countryside: the Mazerat Chapel, The Church of Saint-Martin de Mazerat and that of St. Emilion. Chateau Angelus was then extended little by little by his sons Jaques and Christian, who bought several adjacent plots until in the 1960’s it formed the property that Hubert de Bouard de Laforest, along with his cousin, Jean-Bernard Grenie, run today. 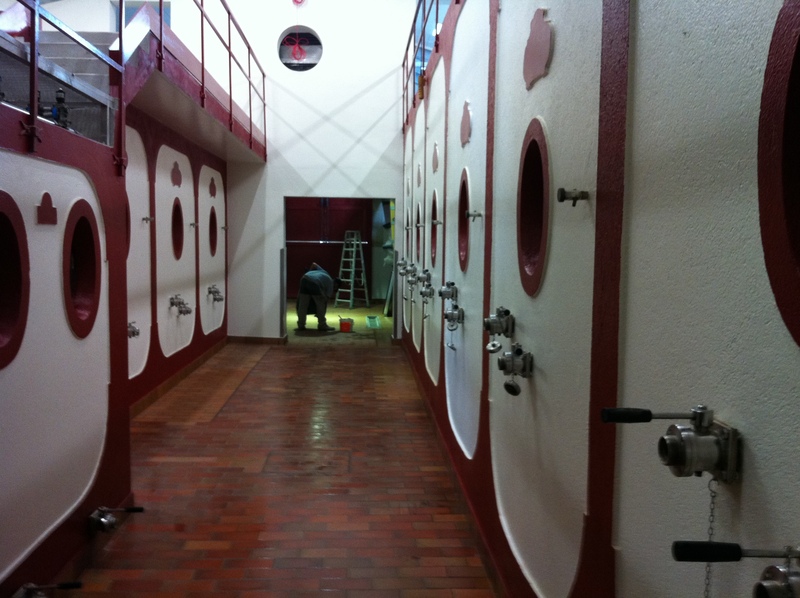 They have shaped a legendary estate, steeped in tradition from the vines and innovation in their winemaking processes. Hubert de Bouard is also in high demand in the region as a consulting winemaker. We met him briefly, and one definitely gets the impression that he is a busy man. Our lovely guide, Bong Tram, took us on a brief tour of the estate, where we saw more sorting going on as part of the harvest. The newly remodeled parts of the estate were quite beautiful – we hope to visit again when it’s finished. The large project was designed by the noted architect Jean-Pierre Errath, and included the creation of new cellars, new guest reception areas, work on the Chateau, business offices and a restoration of their famous bell tower. The newly restored bell tower has 20 beautiful shiny bells, which can be controlled electronically. According to Wikipedia, “The Angelus is a Christian devotion in memory of the Incarnation. The Angelus devotion is usually accompanied by the ringing of the Angelus bell, which is a call to prayer and to spread good-will to everyone on Earth.” In that spirit, Bong handed us what looked like a garage door opener and told us to push a button – suddenly, from the bell tower at Ch. Angelus, the American national anthem began playing in all it’s glory. It was a pretty spectacular display, we admit, and one that you can imagine impresses their many visitors from the far reaches of the globe when their own anthems play. Another shot of the Chateau with the bells. 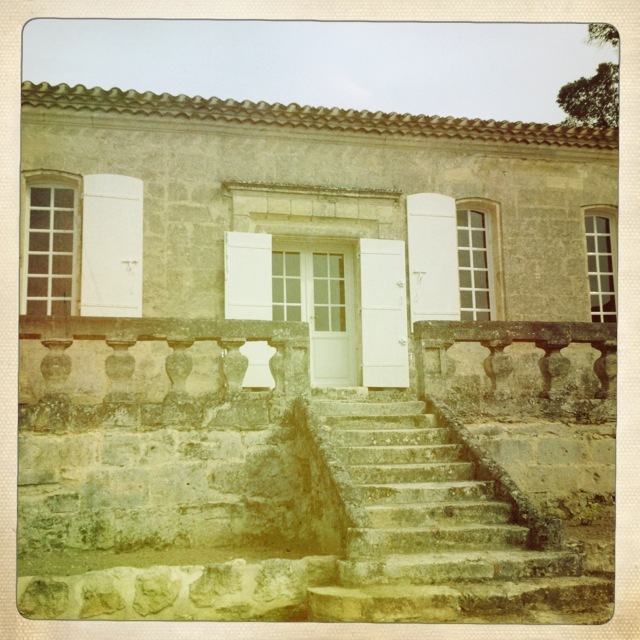 From there, we drove with Bong to a smaller Chateau on the property where we could taste in relative calm from all the activity at the main estate. Frankly, you could have put me in a closet and I would have still had a great tasting experience with these wines. I was so delighted at what Bong decided to open – I’m still grateful for this tasting experience. In fact, thanks to our time at Angelus, a few weeks later, back at home, I was able to pick a 1989 Angelus out of a double-blind line-up of aged Bordeaux – the flavor profile was just so recognizable to me. A smaller Chateau on the property. While St. Emilion and the right bank are known for their Merlot-based wines, Angelus actually uses a fairly high percentage of Cabernet Franc in their blends. 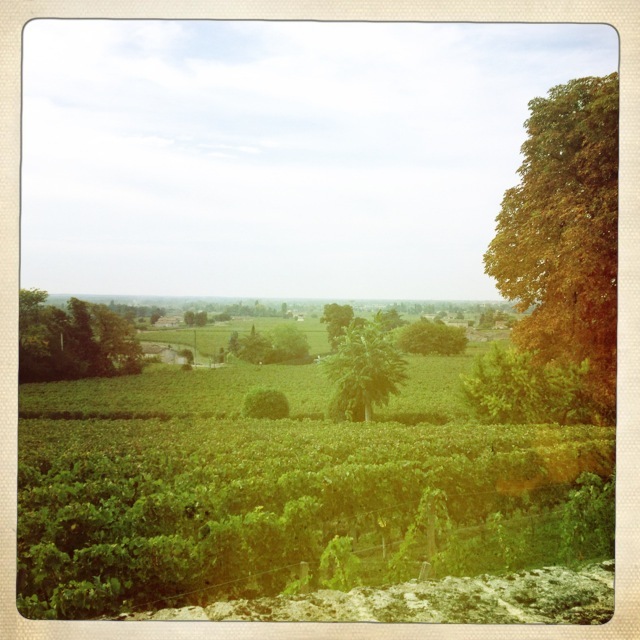 In fact, 47% of the estate is planted with Cabernet Franc, which they care for very judiciously. The vineyards of Angelus are planted on the South-facing slope, and the Cabernet Franc, in particular, are planted at the foot of that slope, which provides excellent drainage for the vines. We happen to be big fans of the Cab Franc grape varietal, so it’s probably no surprise that we’re also big fans of Angelus. 2009 Chateau Bellevue, Bordeaux – Very fresh ripe dark red/black fruit nose. In the mouth, sweet red/black fruit, decent acidity and tannic. Medium-full bodied, with a medium dark fruit tannic finish. Still very young and slightly monolithic at this point, but will improve with more time in the bottle. 2006 Chateau Angelus, St. Emilion – Very fresh, very dark fruit and dark chocolate on the nose. In the mouth, again very dark blackberries, black currants and dark bing cherries combine with dark bittersweet chocolate and spices. This is a very elegant wine that is full-bodied and very complex, but it is also structured for the long haul. The wine is smooth in the mouth and the ripe tannins are very fine. This is such a beautifully elegant wine, that when you are just about to think this is as about as good as a St. Emilion wine can get, the 2005 comes along. 2005 Chateau Angelus, St. Emilion – This is very similar to the 2006 Ch. Angelus, but just increase everything by another notch. Very fresh sweet dark fruit of black berries, dark chocolate and spices. In the mouth, very deep dark blackberries, black currants, ripe dark bing cherries, baking spices and limestone minerality. Full bodied and very concentrated, yet at the same time it feels light in the mouth. 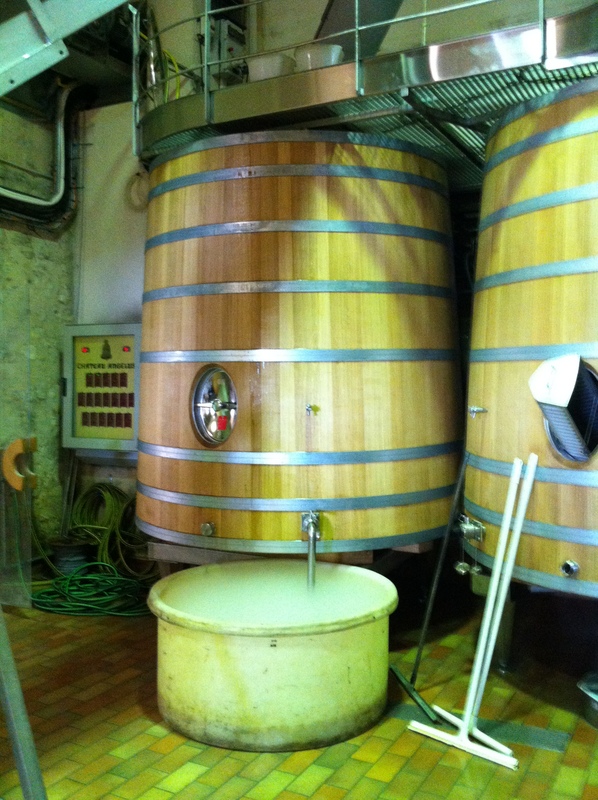 The wine has very good acidity and a freshness to it, that I think comes from the minerality and just gives it a lift. This wine is structured to last 50 years, but the tannins are ripe and so extremely fine. Even though this wine is very tannic and can be enjoyed today, but I would highly recommend that you wait until at least 2020 to open a bottle. The very long sweet black fruit and mineral finish, just does not quit in the mouth. This is an absolutely wonderful and elegant Bordeaux of the highest level and will be a gem in any cellar. Ch. Angelus also considers the 2005 to be one of its legendary vintages – we were privileged to taste it that day. In fact, we longed to stay and finish the bottle (! ), but we had one more pressing appointment. Our thanks to Bong and her team – we certainly hope our paths cross again someday!